The 1" wide American Cutie Ribbon Dog Collar is made with durable nylon and covered with a high quality ribbon overlay. The ribbon is edged in red on a white background, with the lettering in red and blue. It is fully adjustable for the perfect fit. These colors don't run in the wash.
1" wide collars are appropriate for medium to large dogs. 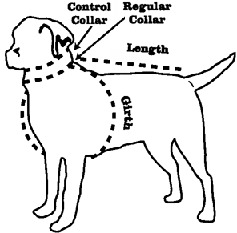 Please measure around your dog around the neck at the regular collar point and add 2". Medium Size fits necks 10"-18"
Large Size fits necks 18"-26"
Includes D-ring near snap closure for your tags and leash.